The history of WWI aviation is a rich and varied story. It was marked by a period of rapid technological development., where aircraft evolved from slow-moving, fragile-powered kits, into quick, agile, sturdy fighters. The Great War consumed the world in a conflict that was unirvaled until that time. It was a kind of war far different than the one that was waged on the ground. The fight for control of the air was where the cunning and bravery of the individual could matter for much. The Albatros D.V was a German fighter airplane used during World War I. In April 1917, Albatros received an order from the Idflieg (Inspektion der Fliegertruppen) for an improved version of the D.III. The Fokker Eindecker fighters were a series of German World War I monoplane single-seat fighter aircraft designed by Dutch engineer Anthony Fokker. Developed in April 1915, the first Eindecker ("Monoplane") was the first purpose-built German fighter aircraft and the first aircraft to be fitted with a synchronization gear, enabling the pilot to fire a machine gun through the arc of the propeller without striking the blades. 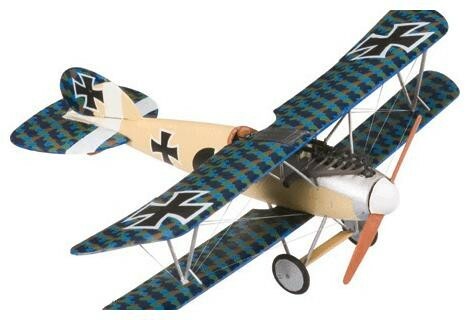 The Fokker Dr.I Dreidecker (triplane) was a World War I fighter aircraft built by the company of Anthony Fokker, and designed by Reinhold Platz. It became most famous as the plane of the Red Baron, Manfred von Richthofen. The Fokker D.VII was a German World War I fighter aircraft designed by Reinhold Platz of the Fokker-Flugzeugwerke. Germany produced around 1,700 D.VII aircraft in the summer and autumn of 1918. In service, the D.VII quickly proved itself superior to existing Allied fighters, leading to a second "Fokker Scourge."